Teresa Abraços has been surfing for more than 30 years, being one of the first female surfers in Portugal. A former portuguese surfing champion, she represented her country in several ISA (International Surfing Association) world and european championships. She loves to travel, specially to Africa. In all her travels, she includes an element of solidarity with the local people – offering learning materials, things so basic but so needed as pens and backpacks; and also surfing equipment. 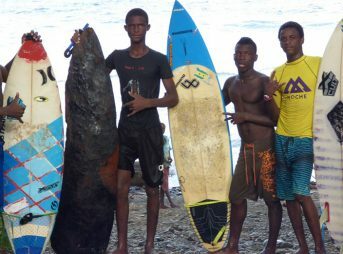 In the last 3 years she has been traveling regularly to São Tomé e Príncipe, where she is helping the development of the local young surfing community. She is involved with the Portuguese Association of Adapted Surfing, a non-profit all-voluntary organization that provides surfing and wave riding experiences to handicapped persons. As she says : “To me, surfing has always been more than competition. Surfing can and must be much more than that ! Surfing makes more sense if we share its pleasure with others. That’s what I try to show in my travels and with my involvement with adapted surfing”.